Where was I before the last week got lost? 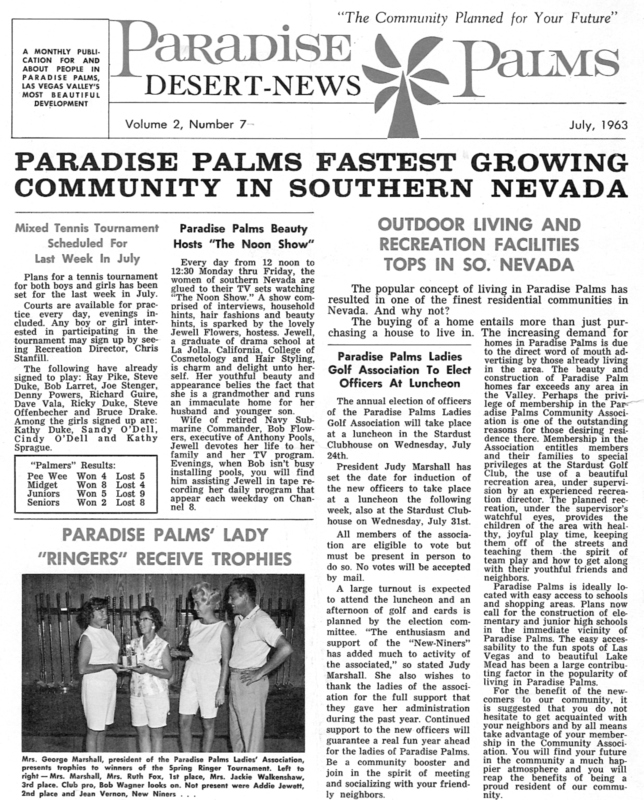 Itâ€™s time for another volume â€“ July 1963 â€“ of the Paradise Palms Newsletters. This one contains a special treat, which weâ€™ll get to on page 3. Thereâ€™s also a lot of great hair, 2 tone shoes to match the dogs, and a real â€œleave it to beaverâ€ moment! Hereâ€™s our special treat. Old time readers will remember that weâ€™ve been championing the cause of getting a school named after Walter Zick, the prolific modernist architect of Las Vegas. Walter Zick is responsible for the Mint, and the â€œPod Schoolsâ€. He designedÂ UNLVâ€™s Maude Frazier Hall, and Flora Dungan Humanities Building; as well as Clark and Valley High Schools. Â We still have numerous banks, office buildings,Â a dozen or soÂ houses. Walter Zick was the preeminent architect ofÂ 1950â€™s and 60â€™s. The body of work that still remains are some of the best examples of modernism in what we now call Vintage Vegas. We did a bus tour of the Zick buildings last October, and a panel discussion with Alan Hess and Walterâ€™s daughters Claire and Karen. 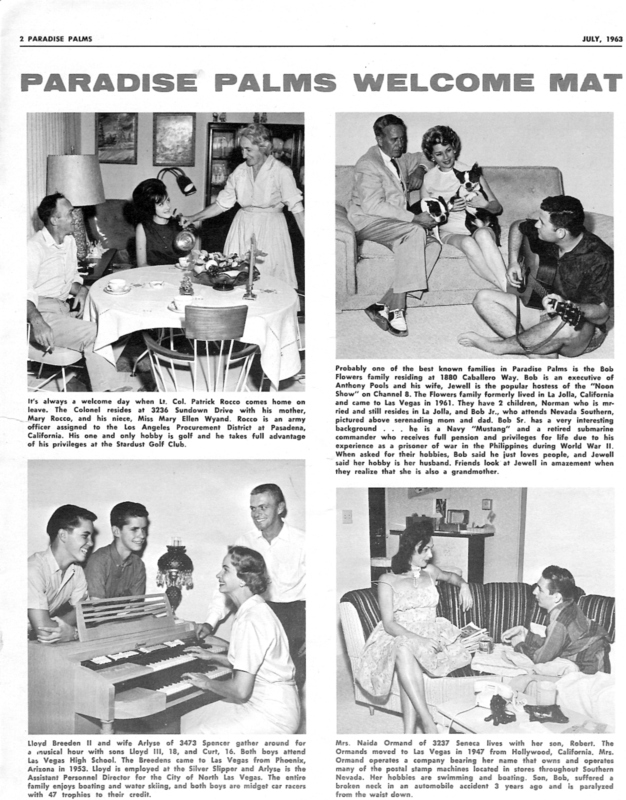 Walter and his family moved from Washington and Decatur to a new home in Paradise Palms in 1963. Claire told us at the panel discussion that people always asked her father why they lived in a tract house when he was an architect. He told them there was nothing he could build that was better than the Bill Krisel designed home in Paradise Palms. 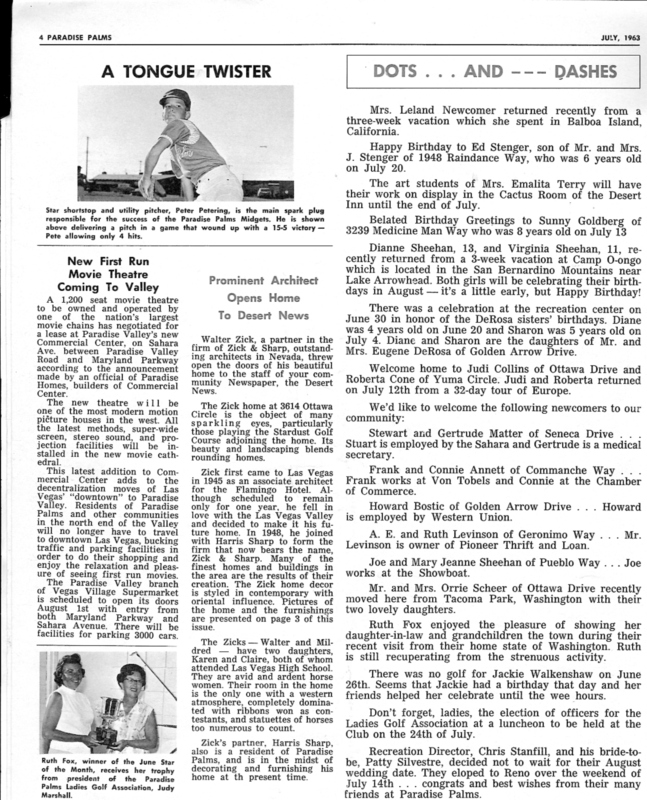 Turns out that Irwin Molasky, the developer of Paradise Palms (or at least his staff) had a lot of respect for Walter Zick, and gave him not only the article on page 4, but a full page of photos. Maybe we should re-think full wall, floor to ceiling draperies! The house is aÂ Bill Krisel design, Plan 8 which weâ€™ll show you in a couple of days. 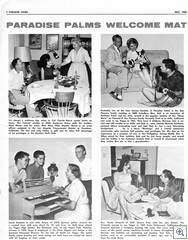 The article in the Paradise Palms Newsletter about Walter Zick is here on page four. For the sake of the search enginesâ€¦Iâ€™m re-typing the article,Â (syntax,Â grammar, punctuation, typoâ€™s and all)Â though it can clearly be read in the scan to the left, which is aÂ clickable thumbnail if youâ€™d like to see it full sized at 8.5 x 11. 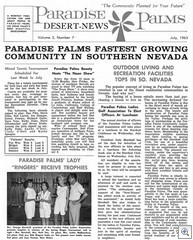 Walter Zick, a partner in the firm of Zick & Sharp, outstanding architects in Nevada, threw open the doors of his beautiful home to the staff of your community Newspaper, the Desert News. The Zick home at 3614 Ottawa Circle is the object of many sparkling eyes, particularly those playing the Stardust Golf Course adjoining the home. Its beauty and landscaping blends rounding homes. 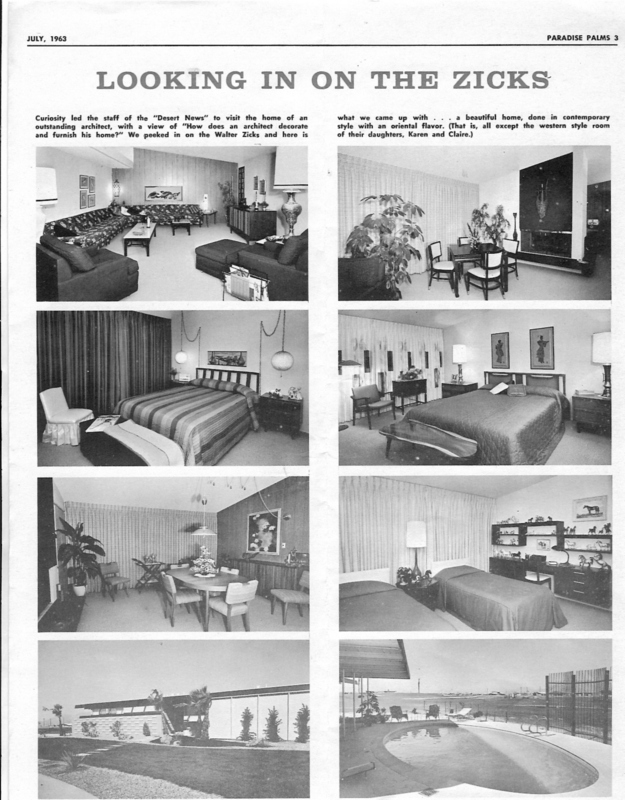 Zick first came to Las Vegas in 1945 as an associate architect for the Flamingo Hotel. Although scheduled to remain only for one year, he fell in love with the Las Vegas Valley and decided to make it his home. In 1948, he joined with Harris Sharp to form the firm that now bears the name, Zick & Sharp. Many of the finest homes and buildings in the area are the results of their creation. The Zick home decor is styled in contemporary with oriental influence. Pictures of the home and the furnishings are presented on page 3 of this issue. 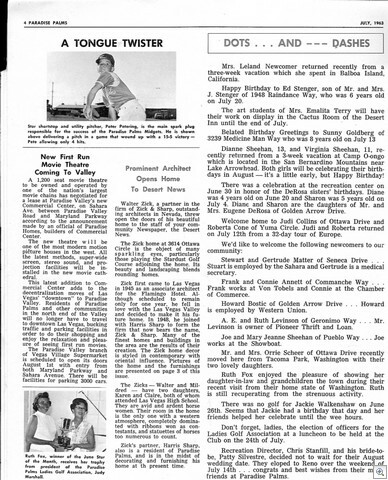 The Zicks â€“ Walter and Mildred â€“ have two daughters, Karen and Claire, both of whom attended Las Vegas High School. They are avid and ardent horse women. Their room in the home is the only one with a western atmosphere, completely dominated with ribbons won as contestants, and statuettes of horses too numerous to count. Zickâ€™s partner, Harris Sharp, also is a resident of Paradise Palms., and is in the midst of decorating and furnishing his home at th present time.